The average home price in the GTA was up over 44% in mid December compared to the same time in 2008. Compared to 2012, the average price was up 10%. 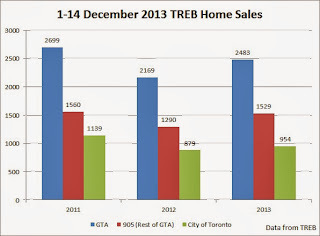 TREB suggests that the lack of new listings was to blame. Others say that prices were just catching up as they slightly declined in mid December of 2012 vs 2011. In my view, the recent rebound in the housing market is mainly psychological. People think that the soft patch in late 2012/early 2013 is over and now it's time to inflate Toronto's housing bubble to a whole new level. I wouldn't be surprised if home prices continue to appreciate strongly until Flaherty steps in yet again. 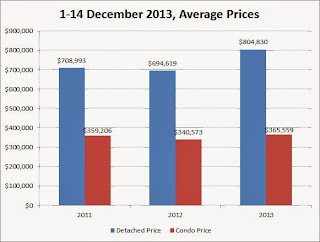 Average detached price in the City of Toronto rose by 16% and condos went up by 7%. On a national basis, home prices were up 9.8% this past November. Did Canadian salaries go up by 10% during the past year? I highly doubt it. For instance, a recent survey revealed that 57% of Canadians were no better off financially in 2013 versus last year. So what's going on? Is this a bubble mentality? Yes, in a way, as the current housing market is primarily driven by the belief that since home prices went up in the past they will continue to increase in the future. Anyway, below are the mid December statistics and charts for Toronto's housing market. 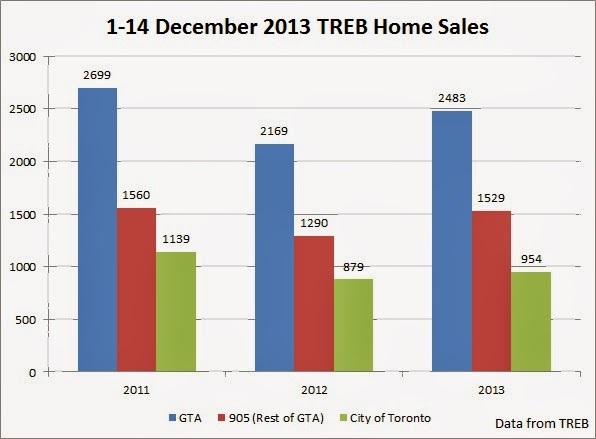 Sales in the GTA were up 14.5% during the first two weeks of December 2013 compared to the mid December 2012 but down 8% from 2011. Sales went up by 18.5% in the 905 and 8.5% in the 416. Average home price in the GTA was up 10.3% and 9.1% in the City of Toronto. Condos were up 7% in the City of Toronto and detached homes were up by 16%. Notice how prices stagnated and even declined slightly back in 2012 as compared to 2011. P.S. So home prices in the GTA were up by 44% since 2008. Guess by how much the average hourly pay went up during the same period? Leave your comment below!